BANGI, 27 May 2014 – Malaysian Chinese associate the Malay language with Malay culture and the Government and thus having negative feelings towards its usage. 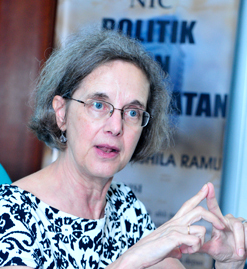 A study by Professor Dr Sharon Carstens, Professor of Anthropology and International Studies at Portland State University (PSU) of the United States said though they recognise Malay as the official language but regarded it as a parochial language that has limited use beyond dealings with the government. She also found that none of her respondents speak Malay within their families though up to 25% of them use English on such occasions. They felt the use of Bahasa Malaysia is only with the government, said Prof Carstens when presenting her findings at a seminar organised by the Institute of Malaysian and International Studies (IKMAS) of The National University of Malaysia (UKM) here last week. Prof Carstens carried out her study by examining Malaysian Chinese language practices and attitudes from local, national, and global perspectives. She said almost all the subjects queried in the study speak multiple languages with the combination of Mandarin, English and the dialects which differed between families but none of the respondents spoke Malay within their respective families. She also found 93% of Malaysian families of Chinese origin speak Mandarin with many different combinations of dialects and currently 53% of the respondents speak Chinese dialects with their parents compared with 42% in 1970. Most of those who took part in the study admitted that they primarily watched Hong Kong and China TV soap operas, Singapore TV, English-language programmes and Korean TV serials. Professor Carstens is the Director of the PSU Institute for Asian Studies and currently Senior Research Associate, Department of Chinese Studies, University Malaya. Even though there is a rising trend in learning Chinese, 25% of those who responded to her study spoke English with their families. The participants of the study insisted that English was still important for them. Her study, which started in 1970, was about multi-lingual Chinese in multi-ethnic Malaysia. Her research in Malaysia is ongoing with data collected even as she was presenting her findings at the seminar. The study was done qualitatively based on questionnaires, conversation recordings of 15 minutes each, social media through facebook/malaysianchineselanguages and conducting focus groups. The questions mostly relate to gender, age, education and the languages spoken. The participants were mostly working people in urban areas. She said her study seem to show that Malaysian Chinese are increasingly turning to Mandarin for use in everyday communications such as conversations and social media with future global implications. Malaysian Chinese feel they have to maintain their ethnic identity even if they are citizens of Malaysia and the most obvious way is through the language also known as Guanhua that is spoken by more people than any other languages around the world. “They might have grown up speaking Cantonese and Hokkien at home while learning Malay and English at school and from friends, but also recognise the ascendency of Mandarin on the global stage,” said Prof Carstens. She said the current dispute on the use of Allah in a non-Islamic context and opposition by some Malay rights groups over non-Malay rights have not helped the Chinese to feel that they are part of an inclusive society. She said in multi-ethnic Malaysia, younger Chinese Malaysians, with varying abilities to read, write and converse in Mandarin, Malay and English represent a new generation of tri-lingual Chinese Malaysian citizens. Prof Carstens research since the late 1970s has included ethnographic research in the Ulu Kelantan Hakka community of Pulai; ethnohistorical research on Yap Ah Loy; research on transnational Chinese mass media with her current research on Malaysian Chinese language identities and ideologies. Her published articles and a monograph (Histories, Cultures, Identities: Studies in Malaysian Chinese Worlds) centre on issues of Chinese folk religion, gender constructions, Hakka Chinese, Malaysian national culture and shifting ethnic and cultural identities over time.